January 7, 2015 by Ecommerce News. About Statistics with tags Hungary. 3642 views. Just as in previous years, the online ecommerce industry in Hungary increased significantly in 2014. Predictions are that the total volume in this Eastern European country should have reached 266 billion Hungarian forints (€833.19 million) by the end of last year. According to eNET this signals the ushering in of a period of steeper growth. This way, three scenarios aros: an optimistic, an adverse and a realistic one. 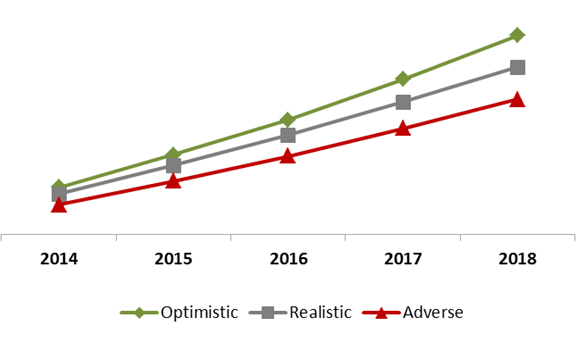 In view of current developments in the local ecommerce industry, eNET’s experts vote for the optimistic scenario for 2014, which forecasts a volume of 833 million euros. This is 153 million euros (or 22.5%) higher than in 2013. During the first period, from 2001 to 2008, the online retail trade volume grew from 10 million euros to 193 million euros. It was a time where the ecommerce industry grew through steady, moderate expansion. That’s not what was happening between 2009 and 2010, when the pace of growth increased and the total ecommerce turnover in Hungary more than doubled, reaching 413 million euros in 2010. Between 2011 and 2012, the market returned to relatively moderate expansion, partly due to the higher base. In 2013, the local ecommerce industry finally exceeded 200 billion Hungarian forints (€626 million), and the share of online business within the total retail trade rose above 3%. The 680 million euros turnover it reached in 2013 is according to eNET “all the more promising as it projects another period of steeper growth (as in 2009-2010)”. As they ask themselves the question whether the fast market expansion will continue in 2014 and thereafter, or the previous moderate growth will return, eNET expects the former scenario. They also think that one of the reasons ecommerce achieved so well in Hungary is because of Black Friday. “These deals offered in Hungarian webshops are a major novelty in this year’s online trade. While there had been similar initiatives before, they only became mainstream in 2014.” During Black Friday and other special days, Hungarian internet users generated 7.2 to 8.4 million euros of business. But eNET is quick to say that the faster overall market expansion is not attributable to Black Friday only. Several big ecommerce players entered the market in 2014 as well; also, Hungarian consumers became increasingly confident to buy goods online. “Finally, logistical innovations such as parcel delivery terminals have added even more convenient options to the range of delivery methods. And product categories that have been generating major business in more developed markets, such as clothing, baby products or toys, are increasing in popularity in Hungary, too”, the company says. And oh, there’s also another thing that could give the Hungarian ecommerce a boost in the upcoming years: according to a recent draft law to take effect in March, all physical stores in Hungary (apart from family stores) will be closed on Sundays, regardless of size.